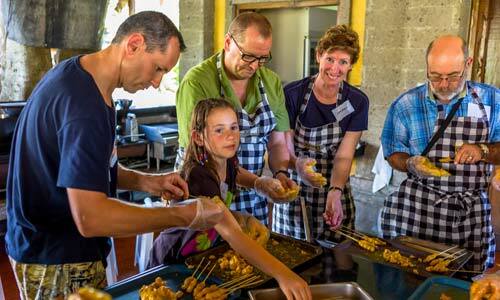 Bali cooking Class is discover the spiced flavors of Bali’s virtually unknown cuisine. Classes offer a fascinating introduction in to the exotic ingredients and unique culinary heritage of Bali. They provide a valuable insight into the various techniques of food preparation and the cooking style used in the paradise of Bali island. With knoing of many kind spice and Balinesse cuisine Bali cooking class will be a memorable experience and a great add-on to an Balinese cooking class. With a wide variety of food recipes Bali cooking class will be your value interest to learning how to make Balinese cuisine that is served by several cooking school in paradise of Bali Island. Bali star Cooking class and Bumbu Bali Cooking Class is located near Ubud area, Aneka Cooking Class is located in Kuta. All of them has different menu to learning. Important: There are a few cooking class school doing this activities, all of them has unique menu to learning. Please choose according to your convenience and please do not hesitate to contact us if there information that we provide is not clear. Bumbu Bali Cooking Class is the very famous in cooking class in Bali, most of their mainstay menu of dishes with very distinctive Balinese spice. in this school you will be taught how to cook by the way of making seasoning to food processing to be made, of course, will be taught directly by chef very well aware with the Balinese recipes. 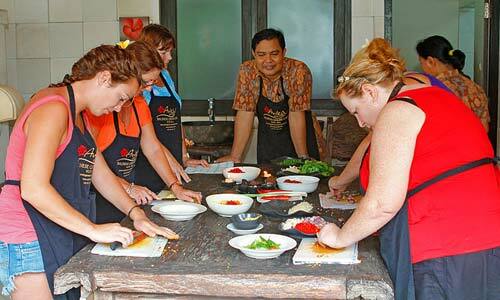 Bali Star Cooking Class is a cooking school located in Ubud area. The recipes are very thick with Balinese cuisine, makes this is one of the professional schools in concocting Bali dishes. With a menu mainstay mostly of how to make food that originated from a recipe that combines with Balinese cooking spices. Aneka Cooking class is the best option if you want to know how to make Balinese cuisine with a variety of recipes. This school serves a very typical Balinese It’s like how to cook fish, vegetables, meat with seasoning combinations Bali very tasty it was. 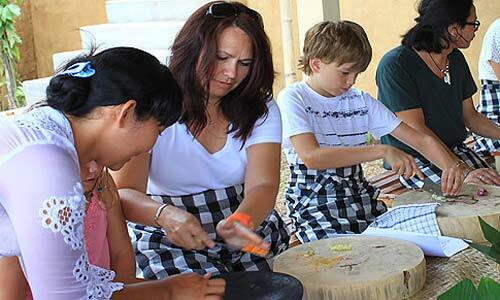 In this school you will be taught how to cook by the chef who is very skilled at cooking.